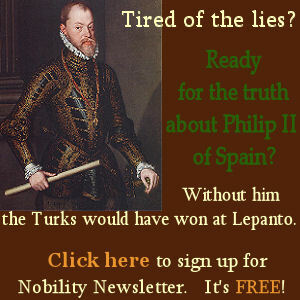 Born at Valencia, Spain, 1 Jan., 1526; died 9 Oct., 1581. His patents were Juan Bertrand and Juana Angela Exarch. 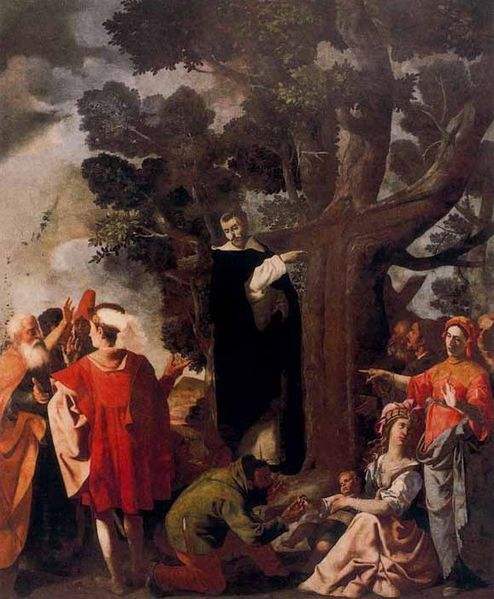 Through his father he was related to the illustrious St. Vincent Ferrer, the great thaumaturgus of the Dominican Order. The boyhood of the saint was unattended by any of the prodigies that frequently forecast heroic sanctity. 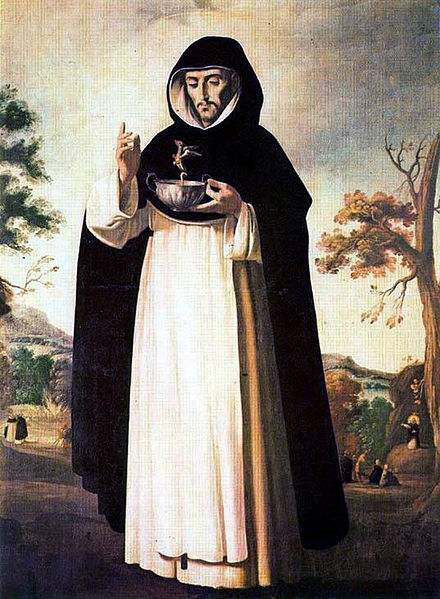 At an early age he conceived the idea of becoming a Friar Preacher, and despite the efforts of his father to dissuade him, was clothed with the Dominican habit in the Convent of St. Dominic, Valencia, 26 Aug., 1544. After the usual probation, in which he distinguished himself above all his associates in the qualities of an ideal religious, he pronounced the vows that irrevocably bound him to the life of perfection. The profound significance of his religious profession served as a stimulus to the increase of virtues that already gave evidence of being cast in heroic mould. In demeanour he was grave and apparently without any sense of humour, yet withal possessed of a gentle and sweet disposition that greatly endeared him to those with whom he came in contact. While he could lay no claim to the great intellectual gifts and ripe scholarship that have distinguished so many of the saints of the Dominican order, he applied himself assiduously to study, and stored his mind with the sacred truths expounded in the pages of the “Summa”. In 1547 he was advanced to the priesthood by the Archbishop of Valencia, St. Thomas of Villanova. The Cross on the Tree, Miracle of Saint Louis Bertrand, Painted by Jerónimo Jacinto de Espinosa. The extraordinary sanctity of the young Dominican’s life, and the remarkable influence he exercised on those about him, singled him out as one peculiarly fitted to lead others along the path of perfection. Consequently, he was appointed to the most responsible office of master of novices, in the convent at Valencia, the duties of which he discharged at different intervals for an aggregate of thirty years. The plague that decimated the inhabitants of Valencia and the vicinity in 1557, afforded the saint an excellent opportunity for the exercise of his charity and zeal. Tirelessly he ministered to the spiritual and physical needs of the afflicted. With the tenderness and devotion of a mother he nursed the sick. The dead he prepared for burial and interred with his own hands. When the plague had subsided, the zeal of the holy novice-master sought to extend the scope of his already large ministry into the apostolate of preaching. Though possessed of none of the natural qualities deemed essential for a successful career in the pulpit, he immediately attracted attention as a preacher of great force and far-reaching influence. The cathedral and most capacious churches were placed at his disposal, but proved wholly inadequate to accommodate the multitude that desired to hear him. Eventually it became necessary for him to resort to the public squares of the city. 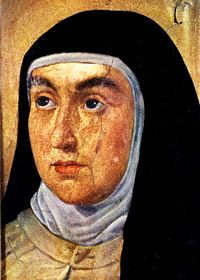 It was probably the fame of his preaching that brought him to the attention of St. Teresa, who at this time sought his counsel in the matter of reforming her order. Unknown to his brethren, St. Louis had long cherished the desire to enter the mission fields of the New World. The hope that there he might find the coveted crown of martyrdom contributed not a little to sharpening the edge of his desire. Possessed of the necessary permission he sailed for America in 1562, and landed at Cartagena, where he immediately entered upon the career of a missionary. The work thus begun was certainly fruitful to an extraordinary degree, and bore unmistakably the stamp of Divine approbation. The process of his canonization bears convincing testimony to the wonderful conquest which the saint achieved in this new field of labour. The Bull of canonization asserts that, to facilitate the work of converting the natives to God, the apostle was miraculously endowed with the gift of tongues. From Cartagena, the scene of his first labours, St. Louis was sent to Panama, where in a comparatively short time he converted some 6,000 Indians. His next mission was at Tubera, situated near the sea-coast and midway between the city of Cartagena and the Magdalena River. The success of his efforts at this place is witnessed by the entries of the baptismal registers, in the saint’s own handwriting. These entries show that all the inhabitants of the place were received into the Church by St. Louis. Turon places the number of converts in Tubera at 10,000. What greatly enhances the merit of this wonderful achievement is that all had been adequately instructed in the teachings of the Church before receiving baptism, and continued steadfast in their faith. St. Louis Bertrand, who is holding a cup with poison, blesses it and the demon leaves the cup. 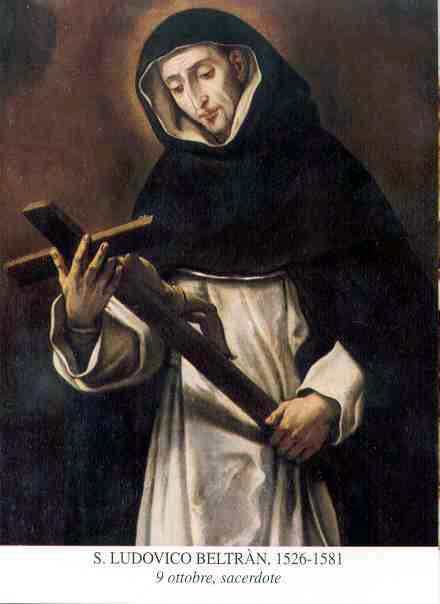 Painting by Francisco de Zurbarán. From Tubera the Apostle bent his steps in the direction of Cipacoa and Paluato. His success at the former place, the exact location of which it is impossible to determine, was little inferior to that of Tubera. At Paluato the results of his zealous efforts were somewhat disheartening. From this unfruitful soil the saint withdrew to the province of St. Martha, where his former successes were repeated. This harvest yielded 15,000 souls. While labouring at St Martha, a tribe of 1500 Indians came to him from Paluato to implore the grace of baptism, which before they had rejected. The work at St. Martha finished, the tireless missionary undertook the work of converting the warlike Caribs, probably inhabitants of the Leeward Islands. His efforts among these fierce tribesmen seem not to have been attended with any great success. Nevertheless, the apostolate among the Caribs furnished the occasion again to make manifest the Divine protection which constantly overshadowed the ministry of St. Louis. A deadly draught was administered to him by one of the native priests. Through Divine interposition, the virulent poison failed to accomplish its purpose, thus fulfilling the words of St. Mark: “If they shall drink any deadly thing, it shall not hurt them” (xvi, 18). Teneriffe next became the field of the saint’s apostolic labours. Unfortunately, however, there are no records extant to indicate what was the result of his preaching. At Mompax, thirty-seven leagues south-east of Carthagena, we are told, rather indefinitely, that many thousands were converted to the Faith. Several of the West India islands, notably those of St. Vincent and St. Thomas, were visited by St. Louis in his indefatigable quest for souls. 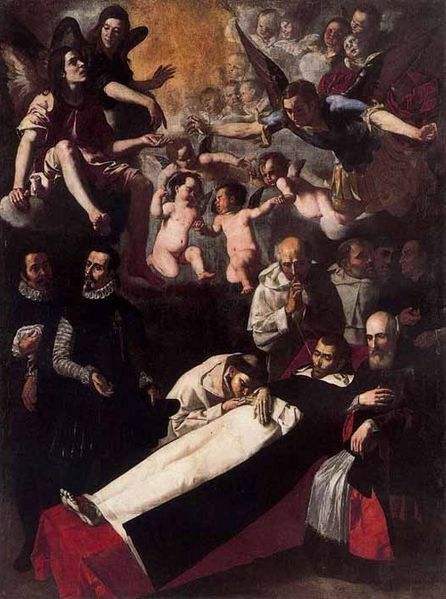 The Death of Saint Louis Bertrand, painted by Jerónimo Jacinto de Espinosa. After an apostolate the marvellous and enduring fruits of which have richly merited for him the title of Apostle of South America, he returned under obedience to his native Spain, which he had left just seven years before. During the eleven remaining years of his life many offices of honour and responsibility were imposed upon him. The numerous duties that attached to them were not permitted to interfere with the exacting regime of his holy life. The ever increasing fame of his sanctity and wisdom won the admiration and confidence of even the officials of the Government, who more than once consulted him in affairs of State. With the heroic patience that characterized his whole life he endured the ordeal of his last sickness. He was canonized by Clement X in 1671. His feast is observed on 10 October. WILBERFORCE, The Life of St. Louis Bertrand (London, 1882); TOURON, Histoire des Hommes Illustres de l’Ordre de Saint Dominique (Paris, 1747), IV 485-526; ROZE, Les Dominicains in Amérique (Paris, 1878), 290-310; BYRNE, Sketches of illustrious Dominicans (Boston, 1884), 1-95.